The GMBand weight loss treatment consists of a mixture of behavioural therapy, personal discussion about your relationship with food and the fitting of a virtual gastric band using gastric band hypnosis. There is no surgery involved, but instead the treatment targets the mental triggers for overeating and eating badly, in order for the patient to regain a healthy relationship with food for the rest of their life. Weight loss and a new, healthy lifestyle are obviously the biggest benefits of the virtual gastric band treatment, but in fact, there are lots of others too. So what other bonus advantages are there to using this kind of treatment? Have you ever eaten too much then felt guilty about it after? How about letting one biscuit turn into 5 or more, then feeling bad you caved in, only when it is too late and the damage is done? A lot of diet plans are based on perfection – cutting out fats, carbs and whole food groups for long periods of time. But none of us are perfect, and these tactics simply aren’t sustainable for successful weight loss. GMBand is NOT a diet. It works to tackle weight issues for good by changing the way you think about and interact with food. This means that you can have the odd treat without having to worry, and know that you haven’t done wrong and can continue happily, not give up. Weight gain and overeating stem from bad eating habits. However, the virtual gastric band treatment works to make you self-aware of your relationship with food so you can take control of the reigns again. If someone offers you food, the impulse is often to take it without thinking. But the GMBand teaches you how to take a step back and make a conscious decision before doing so. A great bonus benefit to the treatment is being strong enough to turn down food you do not need, with total ease. A lot of our decisions about what we eat occur when in the supermarket. You eat what you have in your fridge and cupboards but a big part of the decision happens when you are doing your weekly shop. Many of our clients have told us that after having their virtual gastric band, they found food shopping a lot easier and less stressful. Rather than having to force yourself down the fruit and veg aisle, your new state of mind and attitude towards food, learned during the intensive GMB treatment means you can walk past the chocolate aisle, the treats and the bad things and not even think about it. The GMBand treatment works to eradicate unnecessary cravings for extra food, but here’s a bonus tip for shopping when trying to lose weight. Don’t go to the supermarket on an empty stomach. If you are hungry, you are more likely to fancy a bit of everything and buy too much. If you are full when shopping, when choosing what to buy, you help yourself distinguish between what you WANT and what you NEED. Take a look at this short video of our lovely client Nichol, who talks about the changes in her life that she has successfully implemented in the 6 months since having her GMB virtual gastric band treatment. 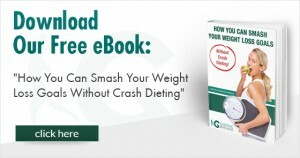 For more information about the GMBand treatment, what it involves and some tried and tested weight loss tips that really do work without having to crash diet, download our free eBook. Simply click on the button below!